St. Martin's Griffin, 9781250098641, 256pp. 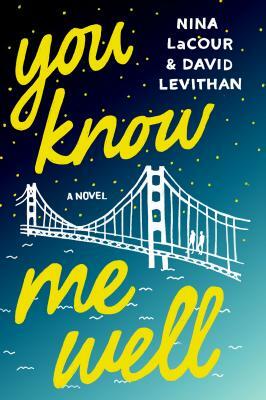 A book told in alternating points of view by Nina LaCour, the award-winning author of Hold Still and The Disenchantments, and David Levithan, the best-selling author of Every Day and co-author of Nick and Norah's Infinite Playlist (with Rachel Cohn) and Will Grayson, Will Grayson (with John Green), You Know Me Well is a deeply honest story about navigating the joys and heartaches of first love, one truth at a time. NINA LACOUR is the award-winning author of Hold Still, The Disenchantments, and Everything Leads to You. A former indie bookseller and high school English teacher, she lives with her family in the San Francisco Bay Area. "Nina LaCour and David Levithan are two of the best YA authors working right now, and this story is further proof. This fun, sweet novel beautifully captures the power of romantic and platonic love alike." -Seventeen Magazine "Top 10 YA Book of 2016"